The anterior thigh skinfold site (also called the front thigh or mid thigh) is one of the common locations used for the assessment of body fat using skinfold calipers. Less commonly the posterior thigh site is used, and another site on the leg is the patella or knee cap site (details below). See the complete list of skinfold sites, and the general procedure for taking skinfold measurements. The mid-point of the anterior (front) surface of the thigh, midway between patella (knee cap) and inguinal fold (crease at top of thigh). A vertical pinch is taken. This measurement is normally taken with the subject sitting and the knee bent at right angles. If there is difficulty in lifting a fold of skin, it may be easier with the leg extended, or with the thigh supported from below by the subject. 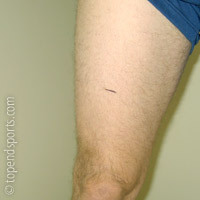 Hamstring (Posterior Thigh) Skinfold — pinch taken at half the distance between the ischial tuberosity and popliteal crease, on the back (posterior) aspect of the thigh. Patella / Knee Cap — a vertical skinfold in the mid-sagittal plane raised 2 cm above the proximal edge of the patella. The subject should bend the knee slightly. Videos of Anthropometric Tests including Skinfold Testing.